Send Text Messages With The D:Scribe Pen | OhGizmo! I’ve always had poor handwriting, especially with cursive. Nowadays I can blame it on the fact that I type everything, but when I was a kid there was really no excuse, except that I was usually in a hurry when writing. Needless to say, I can type much faster than I write, and it looks better too. However, for those of you that enjoy writing everything, or to send text online, here’s an interesting concept design. 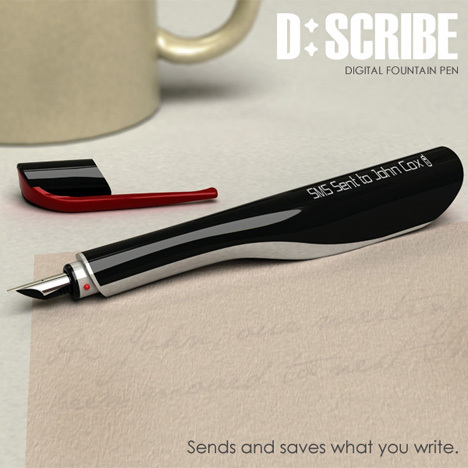 The D:Scribe is a pen that recognizes your handwriting, and sends SMS messages that you scribble down. It communicates with your phone via Bluetooth to send the messages. It can also store your doodles, which can be retrieved on your computer at a later time.